During last year’s Blog World Expo, Sarah and I got invited to dinner with Shawn Collins and Missy Ward, founders of the Affiliate Summit. 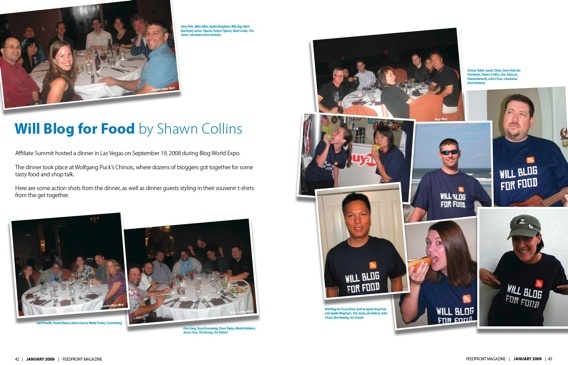 In addition to the Affiliate Summit, Shawn and Missy are also the publishers of FeedFront Magazine. FeedFront is the official magazine of the Affiliate Summit and is read widely by Internet marketers of all stripes. Each issue is filled with information to help you get the most out of your affiliate, Internet and blog marketing efforts. The cool thing about FeedFront is it’s free as long as you live in the US. For those outside the United States, FeedFront is available as a free PDF download. The January issue of FeedFront, which will be the issue everyone will get at next week’s Affiliate Summit West, has an article about the Blog World affiliate dinner. When I got the invite for the dinner, it asked what T-shirt size I wore. When I got home, there was a “Will Blog For Food” T-shirt in my mail. A note said to take a pic of me wearing it and send it to Shawn. Well, now I know what the picture was used for. You can see me on page 43.